Moving from individual account to family account ? I have a 1PW account and I also have another license that I've never used. I was thinking about installing the unused license on her computer, then I thought about 1 PW for Families. What are the advantages to having a Family account? Does each person have access to the other's PWs? Does each person have a unique login? I really wish there was a number I could call to talk to a technical pre-sales person. Having to wait for replies and send multiple messages could be done so quickly over the phone. I'll answer your questions one by one. 1) Advantages to having a Family account - customizable sharing of data, account recovery, automatic access to all apps and version upgrades. You have the ability to invite up to 5 family members per family subscription. Each family member will have access all of our apps (Windows, Mac, Android and iOS). In addition you can view your 1Password data via the web from any device. There is no sync set up required since we take care of all the syncing on our end. 2) Data separation - Each family member by default receives a Private & Shared vault. Private vaults can only be accessed by that member, not by you or anyone else. All members also get access to a Shared vault, and you can create additional vaults to share with specific members and manage things a bit more. A small personal example: I have a Family account with my boyfriend. He can't access the data within my Private vault and same applies to him. This works out great since I don't need to have his data mixed in with my personal data. If we need to share anything with each other, I just copy the item to our Shared vault and he can access the item from there. Some items that I have shared with him are health insurance policies, passport and banking info. 3) Unique login - Indeed! Every member will have their own secret key and master password. Since I already have a subscription account, how do I migrate to a family account? In the sidebar at https://my.1password.com (after logging in) you should see an "Invite People" link. Clicking that will give you the option to upgrade your membership. the password of each family member, in the event they loose their password? Unfortunately, I'm the only person in the family who has taken password management seriously until now, and I don't expect that other family members will be as serious about it as I have been. I've upgraded the account to a family account. When I tried installing 1PW on my wife's ipad, through the app store, the following screen was displayed. Since I already have a family account subscription, I don't want to incur another subscription. the password of each family member, in the event they loose their password? Neither. Scroll up and select the "Get" button. Once installed she'll sign in with the account she created as a result of the invitation you've sent her (assuming you've done that). If you haven't invited her yet use the Invite People link at https://my.1password.com to do so. I can't click on Get, it's disabled. Only Subscribe is enabled to click on. I've already emailed her the invitation link. I didn't want to install ios12 on her ipad, because it is slow on my ipad (we both have ipad Air2's). I don't want her to have the same problem I have-where she has to wait after every keypress. Apple really messed up after iOS10. I have two iPad Air 2 units both running iOS 12 and if anything the opposite has been my experience. I'd highly recommend having the Apple Genius Bar check out your iPad if it is having trouble running iOS 12. 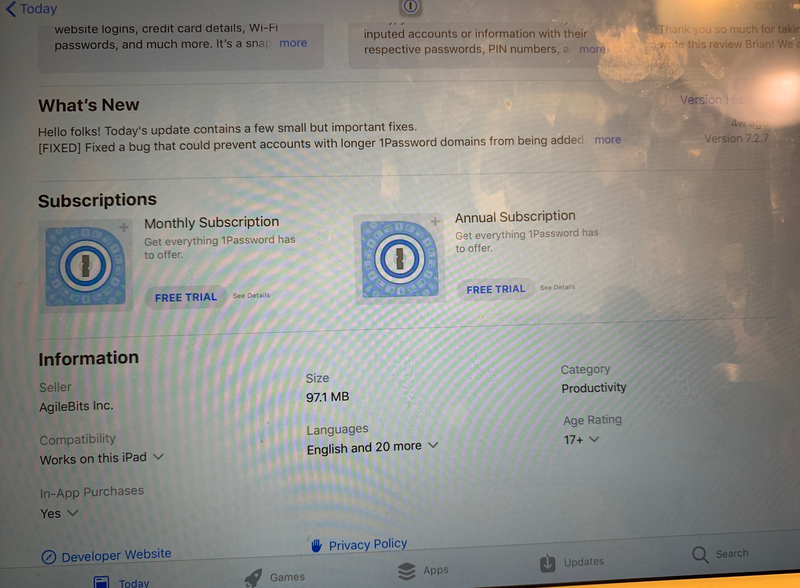 As a security focused company we're always going to push that folks run the latest versions of all of their software, but especially 1Password, their OS (iOS in this case), and their web browser. In this case, iOS 12 is an actual requirement. iOS 11 will not work with 1Password Families accounts. Ios11 & 12 are also painfully slow on our iphone 6s, it's not just the ipad airs. I've ended up upgrading my phone to an XR just to get away from it. That's really odd as that has not been what I've seen with iOS 12 at all. Again I'd recommend checking in with the Genius Bar. If upgrading causes the device to run slow you may need a new battery. Hi, @cappy. I'm not sure where the confusion is, but the guide Ben linked talks about recovery for both team and family accounts. Family accounts do have the same ability as team accounts in this respect, and there's a People tab in the sidebar that lets you access the family members and begin recovery on them. If you're not a family organizer in your account, though, you won't see this tab. If you're not a family organizer in your account, though, you won't see this tab. Sorry, @cappy. That video is pretty old and the interface has changed since then. I'll pass that on to our team. If you scroll down, though, you'll see current instructions that don't involve an "Admin Console".